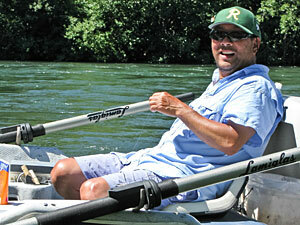 Bruce Skotland - Bruce began fishing at the age of 4 in North Carolina (Bobber fishing for Brim). After His Dad accepted a position as a Plant Pathologist with WSU's research center in Prosser, he and his Dad fished the potholes seep lakes and backpacked the Cascades in search of trout filled mountain lakes. The purchase of a new Schwinn bicycle at the age of 11 allowed Bruce to spend summers exploring the Yakima near Prosser for anything with fins that would bite a hook. Bruce's college years were spent fishing and hunting. The lack of studying eventually led to Seattle to find a job. After marrying, acquiring four kids and commuting in Seattle traffic for fifteen years, the decision was made to move back across the mountains. Since 1989 Bruce has fished an average of 150 days a year on the Yakima River, Naches River, Tieton River, Rocky Ford Creek and a wide variety of lakes in Central Washington. 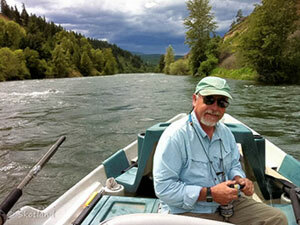 Bruce began guiding in 1993 for Gary's Fly Shope and was senior guide for The Evening Hatch before starting Yakima River Angler Guide Service in 2000 with his wife Bev. Mark Shimazu - Originally from Hawaii, Mark attended the University of Washington, earning a Degree in Architecture. Mark worked in various Seattle area Fly Shops while in school and afterwards and was one of a small group of Anglers who pioneered guiding on the Yakima River. Mark has fished fresh and saltwater destinations across the globe, but most enjoys the dry fly opportunities for trout here in the Western United States. Mark is also a commercial fly tyer, producing flies that cover every aspect of the fly fishing spectrum, but he specializes in Salt Water, Steelhead and Atlantic Salmon flies.